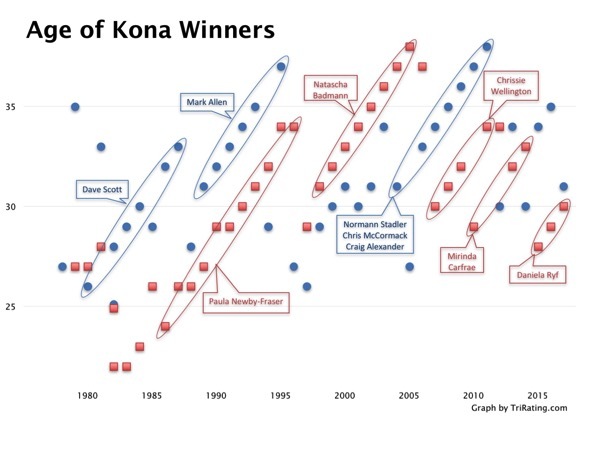 The winnings streaks of Dave Scott (six times between 1980 and 1987) and Mark Allen (six times between 1989 and 1995) clearly stand out. Paula Newby-Fraser’s eight wins occurred over a span of ten years (1986 to 1996). Natascha Badmann took six wins over seven years, her reign was broken twice by Lori Bowden. 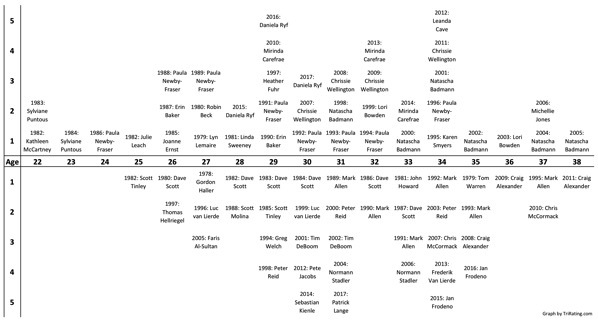 The progression of the men’s winners in the early 2000s looks like another dynasty, in fact it’s three different athletes (Stadler, McCormack and Alexander) that are almost the same age. 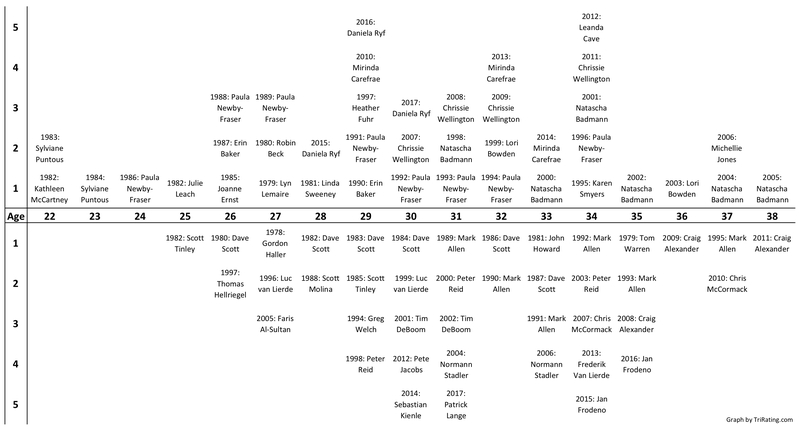 In the last few years, there are three “serial winners” on the female side: Chrissie Wellington (four wins), Mirinda Carfrae and Daniela Ryf (both three wins). The youngest female winners are Kathleen McCartney (1982) and Sylviane Puntous (1983) at 22 years. The youngest male winner was Scott Tinley (also in 1982) with 25 years. Most of the “young winners” are from the early years of the race. Daniela Ryf was the youngest winner in the 2000s, she was 28 in 2015, but there were eleven female winners that were younger than her. On the male side, Faris Al-Sultan was 27 when he won in 2005, he’s the only winner in the 2000s who was younger than 30. Craig Alexander (2011) and Natascha Badmann (2005) are the oldest male and female winners at 38 years of age.